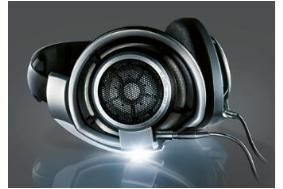 BRISTOL SHOW 2011: Get a free home trial of Sennheiser's HD800 headphones | What Hi-Fi? Visitors to the Sennheiser stand will be given the oportunity to use a pair of HD800s at home on their own hi-fi system for a limited period. Terms and conditions apply. Worth £1000, we described the HD800s as "a very, very fine pair of headphones" when we tested tham, being exceptionally comfortable, with solid bass and a fine musical presentation. "These are terrific headphones, and are definitely worth a listen," we said. So if you'd like to give them a go, pop in to the Sennheiser stand (Bristol Suite) at the Marriott Hotel, Bristol during the weekend of February 25th-27th. More details of the show in our dedicated blog.